TAIWAN FUN MAGAZINE, March, 2005. *Credit Cards accepted. 10% service charge. 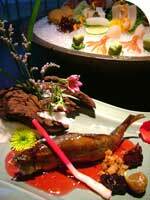 From the traditions of Kaiseki cuisine comes Hachioji's Peony Japanese Cuisine. Priding itself with creative menus and "cha an" style dining, this restaurant recently opened in the 101 Xin Yi Commerical District. With a four to five meter-high ceiling and, over 300 pings of dining space, the restaurant has a classy, cool atmosphere. The name "Peony" suggests exquisitely presented food that can be considered edible works of art. The owner believes that great food does not always have to be flown in from overseas; the importance is to create dishes out of fresh seasonal ingredients. The owner thus brings the chefs along on a search all over Taiwan for the best ingredients. They then add their touches to these ingredients to create works of art. The AA+ Toro Steak (NT$420) from Dong Gang, prepared with an Italian-style red wine vinegar sauce, is best eaten medium rare. The Broiled Halibut (NT$380) uses live fish from Yilan, steamed or baked till the flavor has fully seeped in. Special sauces are dribbled over the fish, filled with roe so that the entire fish can be savoured. There are also a variety of dishes such as the Wild Mushroom Vegetable Soy Bean Nabe (NT$1,200-1,800), Goose Liver Nigiri Sushi (NT$300), Spicy Lobster (NT$580), Business Lunches from NT$680 per person and Dinner Sets from NT$1,500. --By Josie Wu, translated by Cara Steenstra.